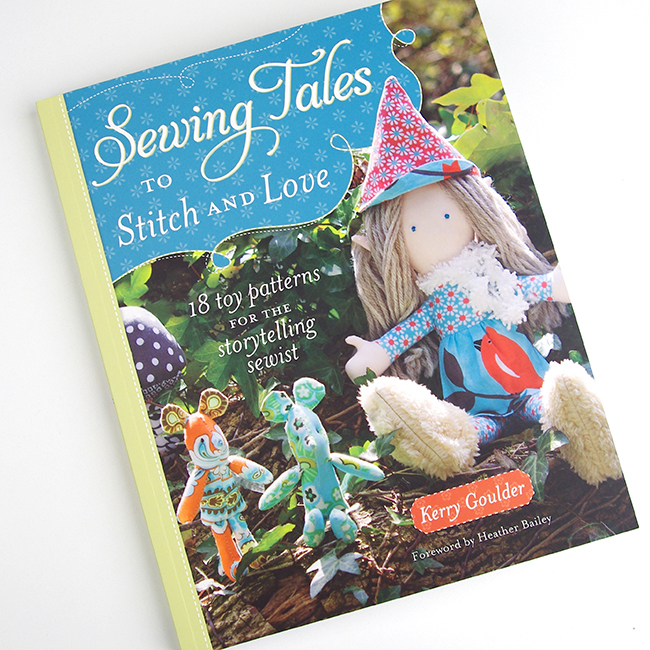 Kerry Goulder, author of Sewing Tales to Stitch and Love, asked me to be a part of her blog hop to promote her book and I couldn’t say no. She’s from Maine and we New England sewists need to stick together! Besides, Kerry’s book looked like a lot of fun. You can preorder the book right now on Amazon or Barnes and Noble. Sewing Tales to Stitch and Love contains 18 toy patterns along with a little story about each project. One is fully immersed in the world of make believe once you pick up this book. The projects range from those that would be doable for the beginner to those that challenge the advanced sewist. The book is beautifully presented. 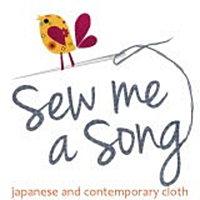 All the projects are made in modern quilting fabrics by designers such as Heather Bailey (who also wrote the introduction) and Amy Butler. 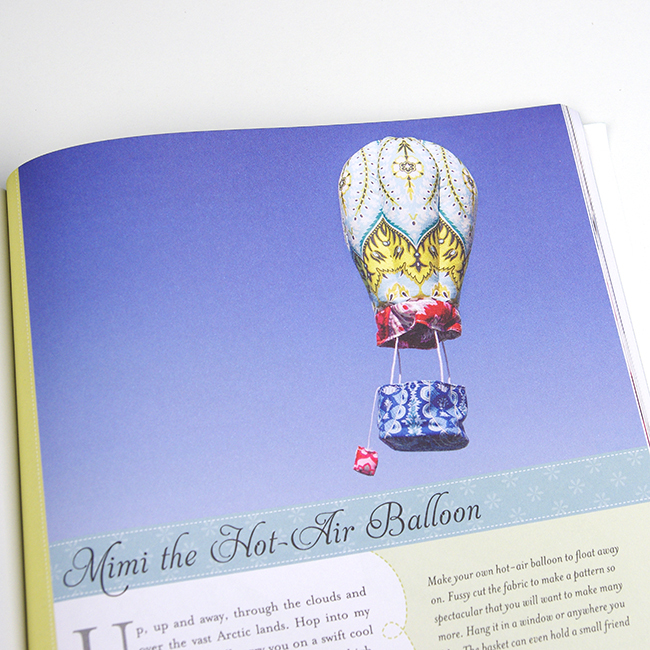 The photography is so fun and actually prompted me to edit the hanger of my hot air balloon project to make it look like it was floating like the photo in the book! I just couldn’t duplicate the jaunty angle. As you can see, the fussy cutting that Kerry did for the book really brings the hot air balloon project to another level. However, these Lottie Da prints by Heather Bailey for Free Spirit matched my daughter’s room where the hot air balloon will hang so I had to forgo the fussy cutting in favor of coordinating! I was really impressed by the way that the balloon is constructed. Kerry clearly has a great talent for three dimensional pattern design. It’s very cleverly made! I hope to apply the things I learned in future projects. 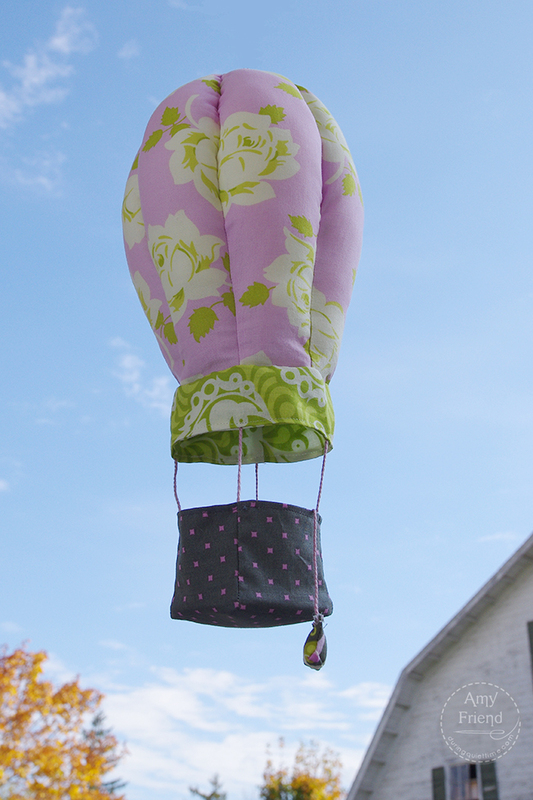 This pattern calls for heavyweight stabilizer for the bottom of the balloon basket and the top of the balloon where it hangs. I wasn’t sure what to use but had some Stitch n Sew Non-Woven Craft Firm Sew In Interfacing in the house and tried that. It worked like a charm so I would recommend it for this pattern. 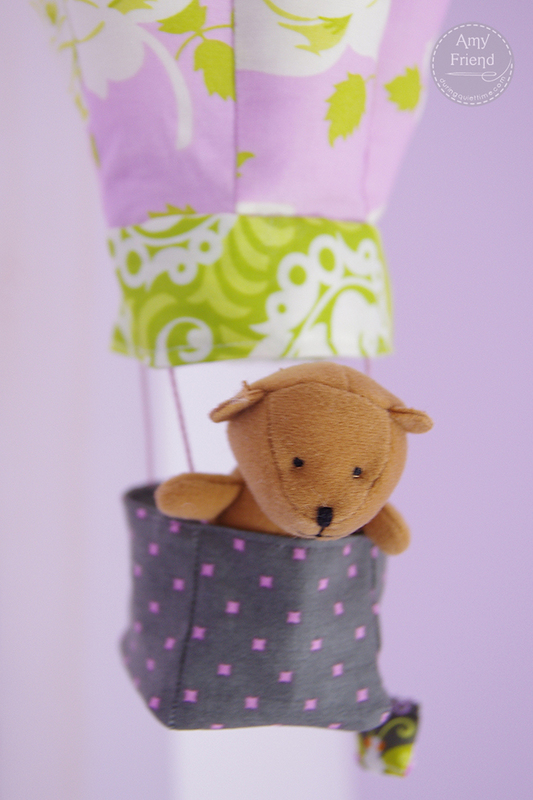 My daughter found the perfect little teddy from her toy box to put in the basket. He is now watching her as she sleeps from his perch above her bed in the hot air balloon. I was tempted by a great number of projects in the book and will likely return to it for some holiday gift making. There are projects that will appeal to both boys and girls and children of all ages. My children ranging from age 4 to 10 and including both a boy and 2 girls, could all find multiple projects in the book that they think I should make for them. I should really learn to hide such books on the top shelf! To check out the other projects in the blog hop, click on the links below! I’d just like to take a moment to thank the wonderful sponsors of this blog hop who provided us with some great tools for three dimensional crafting! You’ll probably want to click through and “like” them on their various social media sites.